Well, that sure didn’t take long did it? In the wake of the June 25th decision by the Federal Drug Administration to approve a cannabis-based CBD-rich epilepsy medication from GW Pharma, a new lawsuit has been filed by a medical marijuana user against the federal government and the plaintiff is calling the FDA as her first witness. 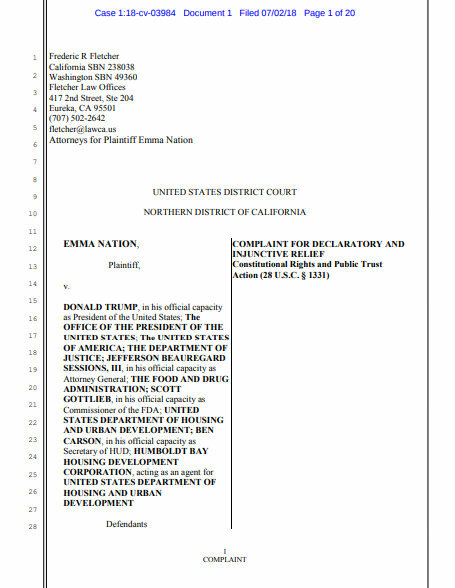 Emma Nation is a resident of Humboldt County, in a small town called Arcata where she lives in a federally subsidized housing unit. According to her lawsuit, a maintenance worker came into her apartment and saw a bag of weed and ratted her out. This led to an eviction notice from the U.S. Department of Housing and Urban Development (HUD) landing on her doorstep. 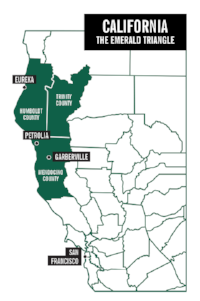 Since cannabis is still illegal at the federal level it didn’t matter that Nation resides in the heart of the “Emerald Triangle”, the mecca of NorCal cannabis cultivation. It didn’t matter that nobody caught her actually smoking the weed at all, let alone in the apartment or on the property. All that mattered is that cannabis is still a Schedule I drug on the federal government’s list of Controlled Substances having been deemed by the feds to have zero medicinal value. And that is at the heart of Nation’s lawsuit; the denial of federal benefits based on perceived medical marijuana use. How can the federal government continue to insist that cannabis has zero medicinal value, and thus that her California-legal medical marijuana recommendation is also of no value when their own FDA just approved a cannabis-based epilepsy medication? Nation’s lawyer, Frederic Fletcher, is confident in his client’s case considering the quandary that the feds finds themselves in despite the failures of similar suits that have come before the court previously. That’s because the game changed on June 25th. The FDA has yet to release a public statement about the case. They probably don’t want Fletcher to roast them with that too. The FDA’s approval of Epidiolex still awaits an ultimate decision by the DEA which now has less than 90 days to figure out how to unfuck the situation that threatens to finally upend the played-out notion that cannabis has no medicinal value whatsoever. Some legal experts predict that the DEA will try to somehow linguistically separate the non-psychoactive CBD compound from the overall cannabis plant if they decide to reschedule anything at all, but GW Pharma’s approved meds are derived from cannabis, not hemp, which paints the DEA into a very awkward corner. Nation’s lawsuit attacks cannabis prohibition from multiple angles, asserting that her First, Fourth, Fifth, and Ninth amendment rights have been violated and even going so far to invoke the Public Trust Doctrine by saying that the federal government’s ignorance on cannabis encourages large-scale illegal grow ops that invariably harm the environment. Her suit not only demands that HUD discontinue their discrimination of MMJ users by denying them access to subsidized housing, it also ambitiously aims to block all federal laws that criminalize the medical use of cannabis in any way, shape, or form. Hell yeah. This could affect everything from MMJ delivery services to banking privileges if Nation and her legal team have their way. There are mixed emotions about the approval of Epidiolex last month. Anytime cannabis can be used to help anyone - especially sick kids - that is a good thing, but you can be sure that the DEA is not going to roll over easily on this. We knew that the ripple effect of this decision would have many unexpected consequences as the feds tiptoe through a minefield of their own making, trying not to set too lenient of a policy on a plant that they have made careers out of by demonizing.